Are you interested in having a Michener Art Museum educator come to your classroom to teach about the arts in our region? 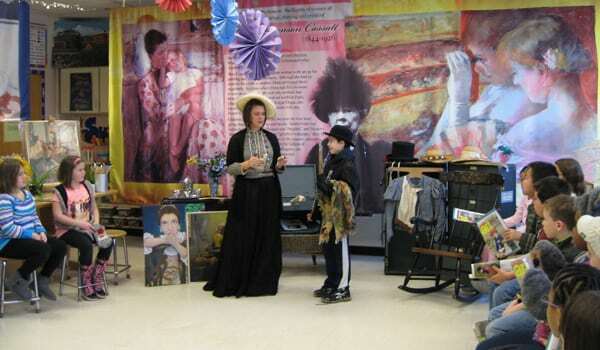 Would you like your students to be introduced to the museum prior to their visit? 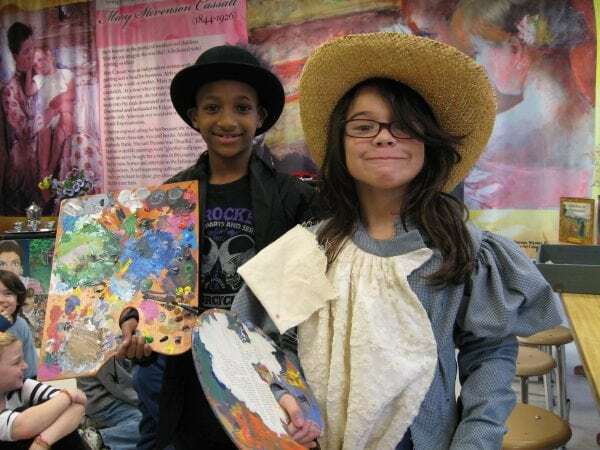 We have various interdisciplinary outreach programs available for you and your students that teach about the arts of our region while connecting to the larger art world. Classes are interactive and include hand-on activities that seek to introduce each class to the museum world as well as to the Michener’s permanent collection and special exhibitions. Lessons engage students in interactive activities that help them experience art in a personal way, encouraging exploration, discovery and multiple ways of identifying with a work of art. We can also customize an outreach lesson for you that ties into your curriculum. Our special Traveling Trunk program includes authentic steamer trunks focused on specific themes, including Pennsylvania Impressionism, Modernism, and George Nakashima, the internationally known woodworker. Below are programs available, some of which are based on our onsite school visit program. If you are looking for a lesson on a particular focus, our education staff can work with you in developing an outreach program that meets your needs. Many of the lessons can be tailored for different age groups. For more information and program fees, e-mail Melissa Easton Sandquist or call 215.340.9800 x124. Discover the role an art museum plays in the community and what’s inside the Michener Art Museum. Students will learn about the various museum staff and their roles, some of the art and artists that are in the museum, and different museum and art terms. This program is a great pre-visit activity for a class planning a field trip to the Michener Art Museum. Using observation and discussion and a diverse array of reproductions from the Michener’s collection, this program will engage students in the process of looking at art. Topics that will be addressed include the elements of art and design and how they work together as a visual language and how artists convey mood with these elements. Lesson will also address different subject matter and materials can be used in creating an artwork. Using a series of examples of landscapes found in the Michener’s collection, students will discuss the elements of a landscape such as foreground, middleground, and background, and perspective. Students will discuss landscape artists of the region and the influences they had in creating their art. Contemporary landscape artists will also be discussed and compared with Pennsylvania Impressionists and what themes are of interest to them. Lesson may address different environmental concerns used by art and artists to communicate a message. Students will explore topics related to the Pennsylvania Impressionists, Pennsylvania history, geography and Bucks County heritage. Works such as The Portrait of Edward Hicks, and Daniel Garber’s mural, A Wooded Watershed, are just some of the highlights in this interdisciplinary lesson. Using examples from the Michener’s collection, students will discuss various kinds of portraiture and how they tell us about the life and times of the subject. The lesson will discuss the evolvement of portraiture and the impact of the invention of the camera on the genre. Students will learn the different tools writers and artists use to make an engaging work, along with learning about parallels that occur in each art form. Activities include in-depth observation, discussion and analysis of works of art from the Michener’s collection. Activities in poetry, creative writing, and storytelling are explored in response to the works. Using a diverse array of works from the Michener’s collection, students will discuss and examine different styles of abstract art from past to the present. Students will discuss various art movements and their impact with the artists and their style. Art criticism, art history and aesthetics are explored while students take a more advanced approach to the art of looking at Bucks County’s art and artists and placing it in context to art movements in history. Students will use critical thinking skills to compare and contrast works of art, while utilizing skills in deductive and inductive reasoning, and making inferences and conclusions. The Traveling Trunk program brings arts resources on a variety of subject matter directly to your classroom. Each “trunk” is filled with art objects, artifacts, visual materials and hands-on activities to enhance student exploration and learning. The Traveling Trunks also feature reference materials and curriculum guides that help arts teachers, classroom teachers, and homeschooling parents integrate the study of global and regional art history with visual art, social studies and language arts classes. Trunks are geared for use with both elementary and middle school students. Lesson plans and activities tie into Common Core Standards, State and National Standards. Trunks can be rented for a day or up to two months, and include an optional introductory lesson for your students by a Michener Art Museum educator. Teacher In-services can also be provided on these programs. The rental fee for each trunk is $75 a month, for up to 2 months. A $100 security deposit is due at time of rental. Deposit will be returned if no items are returned damaged/missing. Optional $100 fee for museum educator in classroom. One-Day Program rental also available for $100, which includes Kit and Educator for one class period, up to 30 students. $50 for each additional class period. For more information, please call 215.340.9800 x124 or email Melissa Easton Sandquist. The Michener Art Museum is pleased to partner with 13 chapters of the Art Goes to School organization, a volunteer-led organization dedicated to bringing the visual arts into the elementary school classroom. Through the use of art reproductions, educators guide students in discussions about various art and artists. The museum has a diverse portfolio of reproductions which are donated and loaned to Art Goes to School volunteers to utilize in their lessons. As part of their involvement, students receive a coupon to return to the Michener with a parent or guardian free of charge. Reproductions of artwork have been generously funded by the Target Corporation and now currently through private sponsorships. For more information on how your Art Goes to School chapter can get involved, contact Melissa Easton Sandquist.